The JDSU FIREBERD 8000 is available to buy refurbished used or rent, usually from our UK stock. Click here to download the JDSU FIREBERD 8000 datasheet. The newest evolution of the FIREBERD family, the FIREBERD 8000 (FB-8000), is designed to meet the needs of users installing and maintaining data communications circuits and network elements. The FB-8000 provides test functionality for a wide variety of technologies, including RS-232/V.24, EIA-530, V.35/306, RS-449/V.36, X.21, MIL-188C, MIL-188-114, and conditioned diphase. Supported applications of the FB-8000 include verifying end-to-end circuit continuity and throughput, emulating datacomm network elements (DTE/DCE), and verifying Quality of Service (QoS). Building on the sucess of the Acterna TestPad platform, the addition of the FB-8000 allows users to easily migrate from datacomm to OC-192/48 and Ethernet technologies, support battery operation, and enjoy the size of a handheld tester all in one instrument. 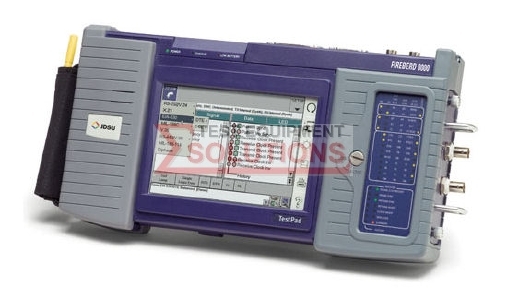 We offer the refurbished used JDSU FIREBERD 8000 Datacoms Error Tester for sale and rental. The JDSU FIREBERD 8000 is fully tested and refurbished in our in-house ISO9001 calibration laboratory. We supply manuals, accessories, full warranty and a free-of-charge Certificate of Conformity. We can also provide the JDSU FIREBERD 8000 with a fresh calibration for a small additional charge. If you have under-utilised test equipment talk to us about trading-in or part-exchanging it towards the JDSU FIREBERD 8000 or other refurbished test equipment.